Reservation & Cancellation Policiy: All contributions are considered Donations as we are a Non-Profit Organization. For volunteer accommodations we request a deposit of $200 to hold reservations, and the remainder in cash upon check-in. If you do not wish to travel with cash, reservations may be paid in full through paypal using your credit card prior to arrival (we request a 5% service charge for credit card payments over $200). Refunds are given if cancellations are made 60 days prior to reservation and are subject to a 25% cancellation fee. Refunds are not given for early departure. We request a one week minimum for reservations December- March, and three night minimum the rest of the year. Type: "I agree to Donation"
This beautiful Mexican style suite, located on the top story of the house shown, is comfortably furnished with two queen-size beds, high-quality linens, and spacious bathroom with tub. 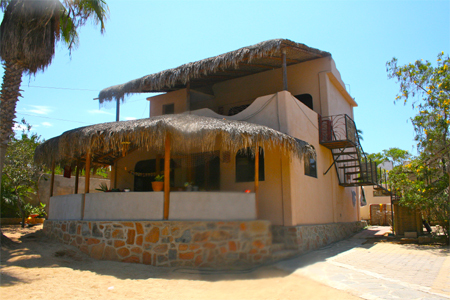 The Suite is conveniently located between centro and the beach. Walk to restaurants, art galleries and markets full of fresh local produce, and still enjoy sunsets from your private, ocean view balcony. The balcony has a mini bar/kitchette with refrigerator. This is the perfect place for couples or small families who want comfort, and privacy close to both downtown and the beach. 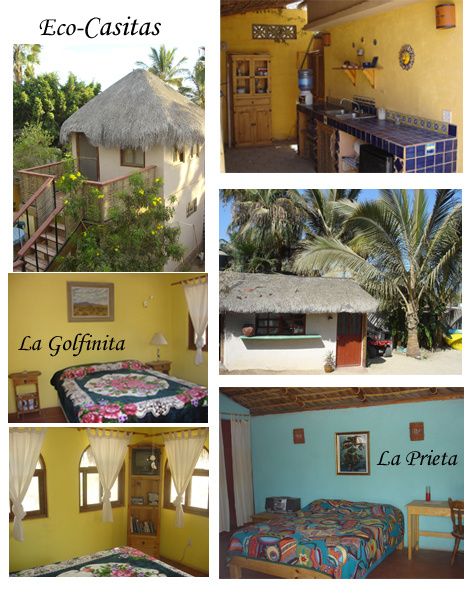 The bottom story of the house also has a palapa covered, ocean view patio, that is available for dining and relaxing. 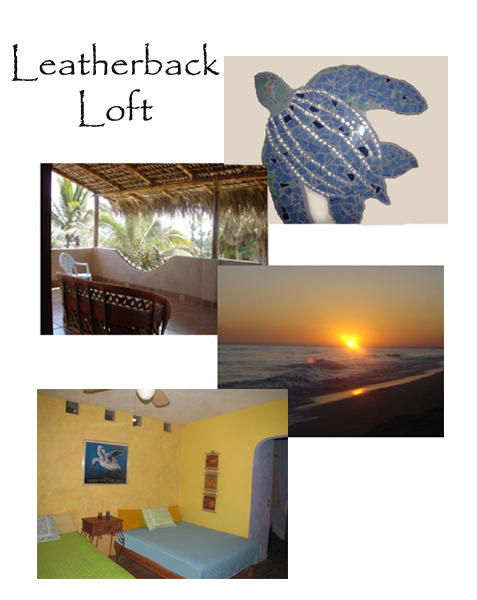 Leatherback's come to nest in Todos Santos October - March! If you are interested in observing this nocturnal spectacular, this is the place to be. 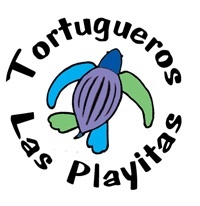 We will wake you up and take you to the nesting site, where you can help in the rescue of the precious eggs! Other amenities include a fully equipped kitchen (shared with Casitas 1 & 2), wi-fi, and off street parking. Our guests recieve a 25% discount on La Sirena's equipment rentals. We request a deposit of $200 to hold reservations and the remainder in cash upon arrival. Refunds are given if cancellations are made 60 prior to resrvation and subject to a 25% cancellation fee.